The eSports world stops for nothing--not even the upcoming blockbuster fighting game Marvel vs. Capcom 3. In today's eSports Update we're bringing you a video guide to gaming mice from Sean "Day" Plott, a clever Starcraft calendar app, and some war stories from Capcom's Marvel vs. Capcom 3 launch party in San Francisco. Back when the Street Fighter series wasn't playable online and Starcraft: Brood War was mostly played in Korea, the pro-gaming mantle rested on Marvel vs. Capcom 2: New Age of Heroes, a 3v3 superhero smashfest that hit arcades worldwide in 2000. While its competitive scene was never as large as today's gaming giants, it nonetheless generated incredible amounts of hype, in part due to the exciting (if visually confusing) gameplay, but also because of fierce rivalries between East Coast and West Coast, Northern California and Southern California, and even individual players--which often led to money matches with several thousand dollars at stake. 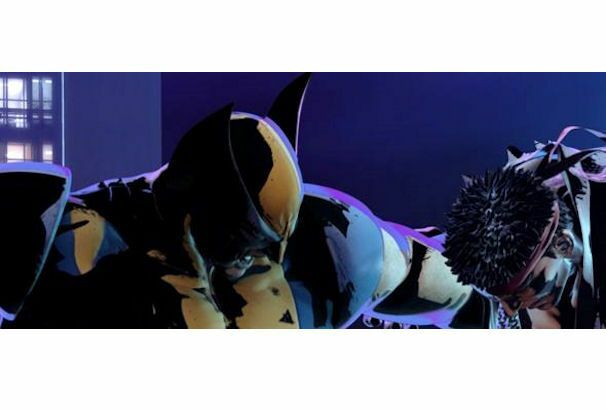 After 11 years, Marvel vs. Capcom is back, and developer/producer Capcom decided to throw it a launch party at San Francisco nightclub Mezzanine, complete with live performances by hip-hop legends DJ Q-bert, Hieroglyphics, and the Wu-Tang Clan's Ghostface Killah. Capcom's groundbreaking Fight Club events staged for Street Fighter IV and Super Street Fighter IV matches look almost tame by comparison. Naturally, Marvel vs. Capcom 3 and Super Street Fighter IV 3D kiosks were plentiful (though the lines were worse). Still, I managed to spend time with both, and wasn't disappointed. The bottom line: If you liked Marvel vs. Capcom 2, you'll like Marvel vs. Capcom 3. If you liked the idea of Marvel vs. Capcom 2 but felt left behind by the sheer amount of technical skill it took to play, you'll like Marvel vs. Capcom 3. If you didn't like Marvel vs. Capcom 2 at all, well, that's probably the deal-breaker, but you might want to give it a look as a rental anyway, if only to see whether the new characters change your mind. So far, it seems like the MVC3 team struck a nice balance between the lightning-fast game mechanics of MVC2. Characters are constantly jumping in and out, combos are long and flashy, and your team can die incredibly fast. That said, MVC3 appears to be tempered by the natural influence of the Tatsunoko vs. Capcom game engine that it's built on, meaning that things are just a bit slower than MVC2, making the game far more accessible to newbies. The combo engine also feels like there's a lot of room for players to create ever more ridiculous strings of attacks--something which was decidedly missing from Capcom's Street Fighter IV series. Check out the combo by Ben "Tragic" Cureton for an idea of what to expect. Super Street Fighter IV 3D is a different beast altogether. Up until now, the Nintendo DS hasn't had many high-quality fighting games (the notable exception being the excellent Bleach DS series). The Nintendo 3DS, on the other hand, will have a tournament-caliber fighting game that plays like a faithful recreation of the original (minus arcade sticks, of course). If that's not enough, the 3D effect could be enough to persuade newcomers to give it a chance as well. The Nintendo 3DS's 3D effect is used in the 3D Mode, a separate game mode which puts your viewpoint behind and slightly above your character's shoulder, rather than the typical perpendicular view found in most fighting games. It looks cool, and it's kind of fun to play with, but don't go into SSFIV3D expecting that to be your primary game mode--it's far too difficult to judge distances with the pixel-perfect accuracy required to be the best. Looking for a high-end mouse to complement your high-end skills? Starcraft master and pro-gaming veteran Sean "Day" Plott has a few tips to resist the hype and pick the mouse that's right for you. It's not easy to stay on top of the Starcraft world. Reading the eSports Update certainly helps, but if you want the play-by-play rather than the Cliff's Notes, you'll have to look elsewhere. 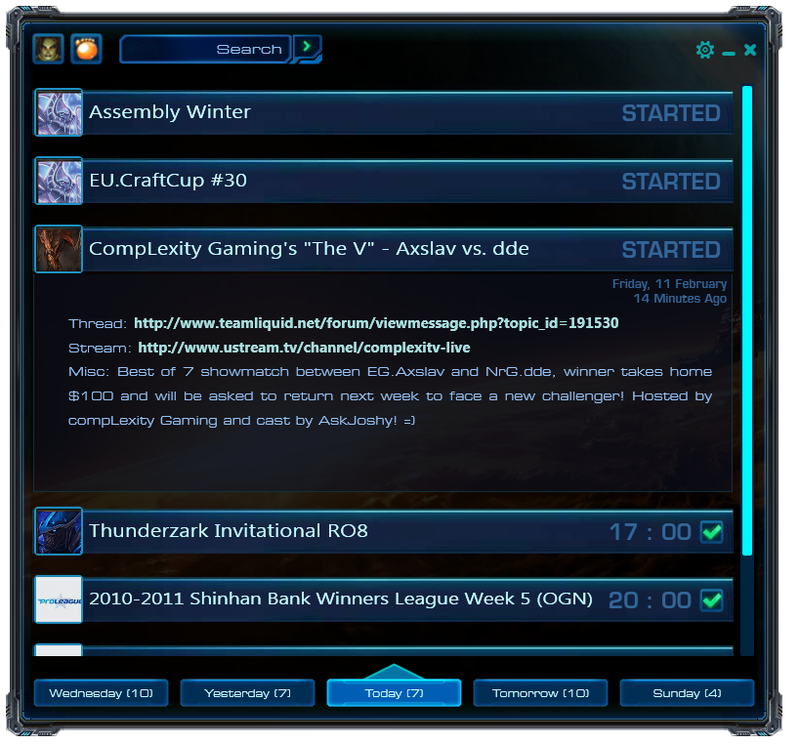 Fortunately, Team Liquid forum member "Tiax;mous" and a few other devs put together this handy ScCalendar app (Windows) which delivers pop-up notifications of upcoming Starcraft II events, RSS feeds of popular Starcraft Websites and YouTube/Twitter/Blip.tv accounts, ready access to player and tournament video streaming feeds, and even built-in chat functionality. Download it here or read more about it in the Team Liquid forum thread.